I may sound very crude and cruel; but Rajesh Khanna’s professional demise had happened long before. When an artist of his stature falls from the grace both professionally and personally it is equivalent to departure. I still could not get out of the magic of that man in his late twenties who appeared and taken the whole nation by storm through an otherwise mediocre film ‘Aradhana’. That was the first film which enjoyed a year’s continuous run in Chennai, Tamil Nadu where Hindi was considered as a demon. The real heroes of the film were Rajesh Khanna and SD Burman and Kishore Kumar. In the opening popular song sequence ‘Mere Sapnon Ki Rani’ where his repeated antics were more clownish than romantic at the first sight. But, what we saw later was an endearing young man who falls in love, courts his maiden, makes her pregnant, dies all of a sudden and reappears as a dynamic youth again to make us gasp. His subsequent films like ‘Anand’, ‘Do Raaste’, ‘Amar Prem’, ‘Kati Patang’, ‘Aan Milo Sajna’, ‘Bawarchi’, ‘Andaz’, and ‘Safar’ brought some of the best acting facets of the sober, romantic hero. In many absurd films his sheer presence made the film click at the box office. All his success should be shared with the excellent musical scores of the composers of his time RD Burman, SD Burman, Laximkant Pyarelal to name a few. True, he reigned supreme with fifteen solo super hits and he has been given the unique name of ‘The Phenomenon’ by the press. In the course of time he got type casted and his films slowly started kissing the dust. I, once a great fan of him felt miserable when I saw him in a film ‘Agar Tum Na Hote’. Though the film and the songs were once again hit I could not stand the haggard wrinkled face of Rajesh Khanna and his characteristic smile, once captivated his fans and the audience, turned to be pathetic. There can never be anything as devastating as ageing. I don’t like to write on his forays in politics. His movies became bad to worse and finally it altogether ceased. He went into a hiatus from which he could never make a come back. It should be accepted with a heavy heart that it is humanly impossible with horrible films, failing health and terrible looks to come back and create the old magic. His strength was his unique charm, and alas, that faded away with time. 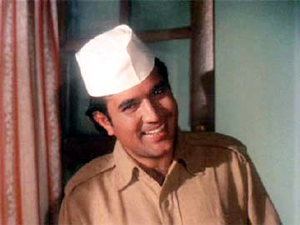 For me, my favorite star Rajesh Khanna died long back; what happened today was his physical death. But ‘The Phenomenon’ will be immortal. The word you have mentioned is not zeolot, but zeolot. Probably, you do not know the meaning. It means a person uncompromising in his stand. From your post, looks like you are one. When one is posting an article in the net, it must be based on facts, not hearsay. Simply saying, "I do not like rajesh' face" is childish. When we are deconstructing a legend, one must be careful. He has his failures & did bad films. Which actor did/does not? If one were to associate an actor's success with his music directors, then rishi kapoor should have been a superstar. His films had fabulous music. By the same logic, I can say that Amitabh's films in the 80s became hits only because he did multi starrers. Anyway, you have posted a blog (even if it is based on hearsay) & cashed in on Rajesh's death to get some publicity. Good for you. Thanks for the interesting response. I really appreciate your admiration for Rajesh Khanna and coming out with information on his popularity. Honestly I cannot and I do not want to counter with a zeolot of Rajesh Khanna. Opinions are personal and so are the views. I think I haven't misused the public media. It is my personal opinion on the star for whom I was a real fan once and who had also fallen from the grace at later stage. That cannot be termed as misuse. If you feel so also I have no objection. After all you have the right to hold and express your views. You have still not answered to the point. Many of his later day films like dhanwan, thodisi bewafaii, avtar, souten, dard etc., were critically & commercially applauded. You have mentioned such films as miserable without even seeing them, I suppose. Anyway, that is your opinion & it need not be the truth. If, as you say, he indeed looked so pathetic in 1983, he could not have had 10 releases in 1984 & 13 releases in 1987. Maybe others are blind too while you are not. There is a notion that he lost superstar status in 1974 itself, which is far from the truth. True, he could not hold on to the staggering hysteria but if you see the number of films he did between 1976 & 179 (his supposedly lean period), you will see that there were at least 5 to 6 releases every year. In 1983 when amit was the superstar, he got so jittery about the release of Aaj ka MLA, that he worked day & night to release his Inquilaab first bcos they had similar story lines. I will recount an incident I witnessed in 1986 in bombay. All the stars had gathered for a walk against video piracy. It was sweltering hot & the walk started. The crowds had come in huge numbers to see & hail their favorite stars. When Rajesh started walking & wiping the sweat, there was a huge spray of flowers on him & the crowd roared. The press were flabbergasted & amit was nervously watching the scene. Finally, a piece of advise. Pls do not misuse the net to post half truths & conceal the facts. I expect these comments to be taken in the right spirit with which it is intended. I read your comments on my Requiem to Rajesh Khanna. I could fathom the pain you felt as an ardent fan of Rajesh Khanna. In fact, I too am a great fan of him. I never missed any of his even mediocre movies during his hay days. But, the fact, cannot be denied. Do you really feel the same charm of Rajesh Khanna of Anand or Andaz in Agar Tum Na Hote? The other films you have mentioned except Kudrat all others are miserable only according to me. Don't you agree that he looked so pathetic in the later part especially when he came for some ceiling fan ad? Age is devastating and in some cases, it completely ruins their personality and pushes them to abysmal depths. It is gratifying to note that still there are fans of Rajesh Khanna like you who are willing to speak for him and his persona. I am really happy about it and as your comments on my writing has come even after 3 years of his demise. Thanks for your emotional expressions. But, sadly I stand by my words. Very badly written. The author has absolutely no idea of the many lovely films done by kaka in the 80s. In Agar tum na hote, he looks handsome & gives a fabulous performance. The movie was a big hit in 1983. He had 10 releases in 1984 & 13 in 1987. If the people did not really want to see him, would the producers have approached him & cast him in their films? Swaminathan- watch his 80s films - dhanwan, kudrat, avatar, khudai, amrit & many others to know the eral picture.